There have been many cars I have tested as of late. However, the one car now that all other cars will be based upon (excluding some design components to the interior, which we will get to) is the Tesla Model S P85 (for Performance and 85 kilowatt battery pack aka plenty of juice for a long time). The test was done in four days plus a few hours. Yet one thing was clear: forget the worry about charging and realize I drove 789 miles in four days with no home charger; only used the SuperChargers across the Tri-State area of New York and Connecticut. Day One was the pickup day at the Mount Kisco store in Mount Kisco, NY. Given that I don't live far from the store, I just left my car there and took the Tesla for four days. The manager was cool and didn't mind that I left it there since the next week he was expecting a delivery of over 80 cars. That deserves: Boom! So off I went on my first ride which had a charge (not full) of 230 miles. After predicting my driving patterns over the trip to the JFK Airport SuperCharger I was driving toward the range increased. Yup. I got more charge as I drove this car so the only thing to do was enter a new SuperCharger as easily listed on the front dashboard (or a large flatscreen computer. Take your pick) and then Syosset, New York was the next logical place to charge. After driving to the charger with still about 65 miles left on charge, I backed up the car and plugged into the SuperCharger. After a cup of coffee, a bathroom break and checking out the Tesla Roadster sitting in the dealership for a bit (then sitting inside of it) I had almost a full charge of over 270 miles. For those that think 270 miles is just that; no dice, not on an electric car. You see regenerative braking adds miles to the charge. In this case the dynamic regenerative braking gave me about 320 miles estimated range. I guess my version (like an iPhone) of driving the car helped me go further on a charge than previous updates (that have been reported). This is according to the owner of a Model S that was charging his car next to mine at the Syosset store. The rest of Day One into Two was driving home, around town and performing all the ordinary driving tests up and down the Taconic State Parkway to the Sprain Brook and Bronx River Parkways in Westchester County and Bronx County in New York. At the end of the Bronx River Parkway (going south) is a turn around so the rest of the test is then heading North. Then I visited friends to show them the car and how fast it was. Everyone seemed to love the idea that the door handles come out to greet the person with the Key Fab as they approach the car. They also loves the screen that was almost the size of two iPad's. So after my charging in Syosset and for the rest of Day Two, I did NOT use the portable charger. The bottom line was there was no need; nor was it a concern in this electric car. Without question, this was the first time ever that I have driven an electric car that there was no worry to refuel. Now in early 2000's I would test electric cars for the State of NY. Never did they have the range of a Model S; so no worry means no worry. That's huge for the electric car industry and particularly Tesla Motors. Let's continue. Day Three was to charge the car at the Mount Kisco store. Once there, I realized it wasn't a fast charger (weird) aka the SuperCharger. After driving not far to the first exit on the Merritt State Parkway in Connecticut was the first set of SuperCharger's nearby. After getting off the exit and passing the Mobil station, there was a whole section of SuperChargers where I plugged in for free. While there, I went to take care of business, had a cup of coffee and an egg and cheese on a bagel. After having my food and coffee, I went to the car. 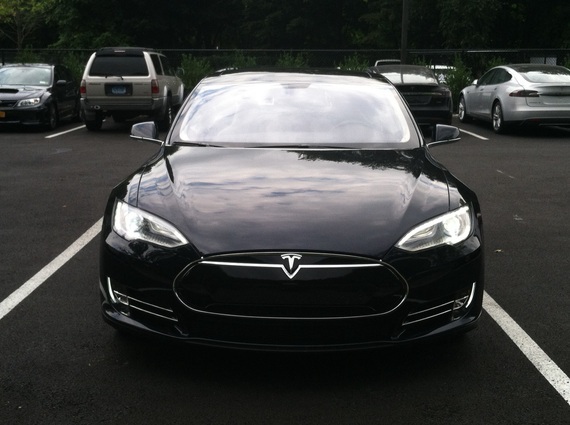 In only 15 to 20 minutes the Tesla Model S was almost fully charged at 270 miles. That was enough for me to feel confident and drive away. The rest of Day Three and Day Four were purely driving days. It also included the performance tests needed, and without a question this car can do what it delivers and then some folks. Everyone's first reaction while I hit the accelerator from 0-60 was their head snapping back into the seat. The 100 percent Torque at Zero RPM means when I step on the accelerator the car is full tilt all in, shake and bake fantastic electric car! Even with all the tests, fast and slow, one thing is for certain: the car odometer read 789 miles travelled. That number was based on real odometer miles and no shortcuts. Again, this was the first time I never worried about fuel for a car or where to charge. It just never became an issue with this electric car. As well, since I have to remain impartial and my bias toward electric, I would tell you all if this car had a problem with range. I have nothing to hide here. This car performed. No, it over performed and that makes this my ultimate test of all-electric driving for days on end without worry about where to charge and how many times I played with the power of the torque. Now, the Model S without question needs some more bells and whistles inside (besides that basic O.S. bar above your head near the door. There were none of those or magazine holders in the back seats, nor a center console to rest coffee or beverages for passengers). So that needs some reworking from Elon Musk. Yet believe me! This car WILL revolutionize the automotive industry. At this rate, it's obvious to me that Tesla will continue to excel. I want to test the Model X SUV and a regular 85 kilowatt pack (versus performance) to see what the range is on that version of the Model S. People just need to know reality. This is a real electric car that car can blow past a Dodge or Mustang. Don't kid yourself about how great this car is and what it means for the automobile industry, oil and the economy.